"Gold master" redirects here. For other uses, see Gold master (disambiguation). 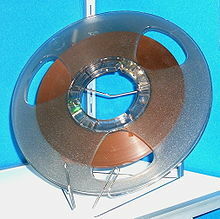 Magnetic tape was commonly used to create master copies. Mastering, a form of audio post production, is the process of preparing and transferring recorded audio from a source containing the final mix to a data storage device (the master), the source from which all copies will be produced (via methods such as pressing, duplication or replication). In recent years digital masters have become usual, although analog masters, such as audio tapes, are still being used by the manufacturing industry, notably by a few engineers who have chosen to specialize in analog mastering. Mastering requires critical listening; however, software tools exist to facilitate the process. Results still depend upon the intent of the engineer, the accuracy of the speaker monitors, and the listening environment. Mastering engineers may also need to apply corrective equalization and dynamic compression in order to optimise sound translation on all playback systems. It is standard practice to make a copy of a master recording, known as a safety copy, in case the master is lost, damaged or stolen. In the earliest days of the recording industry, all phases of the recording and mastering process were entirely achieved by mechanical processes. Performers sang and/or played into a large acoustic horn and the master recording was created by the direct transfer of acoustic energy from the diaphragm of the recording horn to the mastering lathe, typically located in an adjoining room. The cutting head, driven by the energy transferred from the horn, inscribed a modulated groove into the surface of a rotating cylinder or disc. These masters were usually made from either a soft metal alloy or from wax; this gave rise to the colloquial term waxing, referring to the cutting of a record. After the introduction of the microphone and electronic amplifier in the mid-1920s, the mastering process became electro-mechanical, and electrically driven mastering lathes came into use for cutting master discs (the cylinder format by then having been superseded). Until the introduction of tape recording, master recordings were almost always cut direct-to-disc. Only a small minority of recordings were mastered using previously recorded material sourced from other discs. In the late 1940s, the recording industry was revolutionized by the introduction of magnetic tape. Magnetic tape was invented for recording sound by Fritz Pfleumer in 1928 in Germany, based on the invention of magnetic wire recording by Valdemar Poulsen in 1898. Not until the end of World War II could the technology be found outside Europe. The introduction of magnetic tape recording enabled master discs to be cut separately in time and space from the actual recording process. Although tape and other technical advances dramatically improved audio quality of commercial recordings in the post-war years, the basic constraints of the electro-mechanical mastering process remained, and the inherent physical limitations of the main commercial recording media—the 78 rpm disc and later the 7-inch 45 rpm single and 33-1/3 rpm LP record—meant that the audio quality, dynamic range,[a] and running time[b] of master discs were still limited compared to later media such as the compact disc. From the 1950s until the advent of digital recording in the late 1970s, the mastering process typically went through several stages. Once the studio recording on multi-track tape was complete, a final mix was prepared and dubbed down to the master tape, usually either a single-track mono or two-track stereo tape. Prior to the cutting of the master disc, the master tape was often subjected to further electronic treatment by a specialist mastering engineer. After the advent of tape it was found that, especially for pop recordings, master recordings could be made so that the resulting record would sound better. This was done by making fine adjustments to the amplitude of sound at different frequency bands (equalization) prior to the cutting of the master disc. Record mastering became a highly prized and skilled craft, and it was widely recognized that good mastering could make or break a commercial pop recording. As a result, the independent mastering studio was born. Early independent mastering engineers included Doug Sax, Bob Ludwig, Bob Katz and Bernie Grundman and Denny Purcell. In large recording companies such as EMI, the mastering process was usually controlled by specialist staff technicians who were conservative in their work practices. These big companies were often reluctant to make changes to their recording and production processes. For example, EMI was very slow in taking up innovations in multi-track recording[c] and they did not install 8-track recorders in their Abbey Road Studios until the late 1960s, more than a decade after the first commercial 8-track recorders were installed by American independent studios. In the 1990s, electro-mechanical processes were largely superseded by digital technology, with digital recordings stored on hard disk drives or digital tape and mastered to CD. The digital audio workstation (DAW) became common in many mastering facilities, allowing the off-line manipulation of recorded audio via a graphical user interface (GUI). Although many digital processing tools are common during mastering, it is also very common to use analog media and processing equipment for the mastering stage. Just as in other areas of audio, the benefits and drawbacks of digital technology compared to analog technology are still a matter for debate. However, in the field of audio mastering, the debate is usually over the use of digital versus analog signal processing rather than the use of digital technology for storage of audio. Digital systems have higher performance and allow mixing to be performed at lower maximum levels. With peaks between -3 and -9 dBFS on a mix, the mastering engineer has enough headroom to process and produce a final master. It is important to allow enough headroom for the mastering engineer's work. 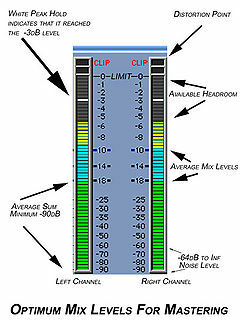 Reduction of headroom by the mix or mastering engineer has resulted in a loudness war in commercial recordings. The source material, ideally at the original resolution, is processed using equalization, compression, limiting and other processes. Additional operations, such as editing, specifying the gaps between tracks, adjusting level, fading in and out, noise reduction and other signal restoration and enhancement processes can also be applied as part of the mastering stage. The source material is put in the proper order, commonly referred to as assembly (or 'track') sequencing. These operations prepare the music for either digital or analog, e.g. vinyl, replication. If the material is destined for vinyl release, additional processing, such as dynamic range reduction or frequency dependent stereo–to–mono fold-down and equalization, may be applied to compensate for the limitations of that medium. For compact disc release, start of track, end of track, and indexes are defined for playback navigation. Subsequently, it is rendered either to a physical medium, such as a CD-R or DVD-R, or to computer files, such as a Disc Description Protocol (DDP) file set or an ISO image. Regardless of what delivery method is chosen, the replicator factory will transfer the audio to a glass master that will generate metal stampers for replication. The process of audio mastering varies depending on the specific needs of the audio to be processed. Mastering engineers need to examine the types of input media, the expectations of the source producer or recipient, the limitations of the end medium and process the subject accordingly. General rules of thumb can rarely be applied. Transferring the recorded audio tracks into the Digital Audio Workstation (DAW). Sequence the separate songs or tracks as they will appear on the final release. Adjust the length of the silence between songs. Process or "sweeten" audio to maximize the sound quality for the intended medium (e.g. applying specific EQ for vinyl). Transfer the audio to the final master format (CD-ROM, half-inch reel tape, PCM 1630 U-matic tape, etc.). Applying noise reduction to eliminate clicks, dropouts, hum and hiss. Equalize audio across tracks for the purpose of optimized frequency distribution. Dynamic range compression or expansion. To finish mastering a CD, track markers must be inserted, along with International Standard Recording Code (ISRC) and other information necessary to replicate a CD. Vinyl LP and cassettes have their own pre-duplication requirements for a finished master. ...the product of mastering, regardless of the type of format, is re-actualised into a performance in the hands of the DJ. In this regard, the shift from vinyl records to digital formats in many DJ scenes and the appearance of new digital formats for DJs have encouraged new practices also among mastering engineers, whose targets are not only music listeners but, specifically, music performers as well. ^ Dynamic range was limited by the fact that if the mastering level was set too high, the cutting head might be damaged during the cutting process or the stylus may jump out of the groove during playback. ^ Running times were constrained by the diameter of the disc and the density with which grooves could be inscribed on the surface without cutting into each other. ^ In multi-track recording each signal input is recorded to its own track on a multi-track recorder. This multi-track tape is mixed down to a mono or stereo master tape. A multi-track tape may be remixed many times, in different ways, by different engineers, giving the possibility of several masters (mono version, stereo version, LP version, AM radio version, single version, etc.). ^ a b Blair Jackson (May 1, 2006). "Issues in Modern Mastering". Mix Magazine. Archived from the original on May 24, 2007. ^ a b c d e Robert Auld. "Mastering Then and Now". Retrieved 2016-01-19. ^ Martin, George; Hornsby, Jeremy (1994). All you need is ears. Macmillan. p. 143. ISBN 0-312-11482-6. ^ a b c Shelvock, Matt (2012). Audio Mastering as Musical Practice. Ontario, Canada: ETDR: University of Western Ontario. pp. 1–72. ^ Nardi, Carlo (2014). "Gateway of Sound: Reassessing the Role of Audio Engineering in the Art of Record Production", DanceCult 6(1), 9. This page was last edited on 29 March 2019, at 12:33 (UTC).